Placed between the camera body and lens, a teleconverter contains a set of optics that will effectively increase the focal length of any lens with which it is used. 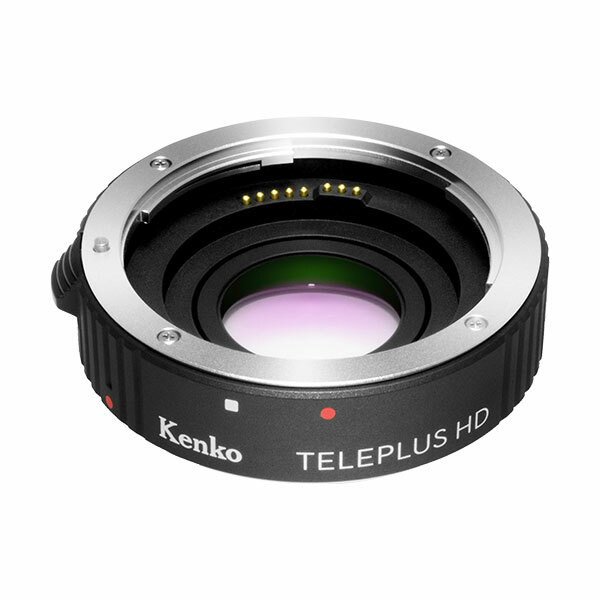 The KENKO TELEPLUS HD DGX 1.4X converter has the effect of multiplying the focal length of your lens by 1.4X, turning a 300mm lens into an equivalent 420mm. The HD DGX 1.4X converters have genuine Gate Array IC (Integrated Circuitry). This means the converter's unique circuitry maintains signal integrity between the camera body and lens. The 3~5-element design made with high quality multi-coated optical glass supplied by Hoya Corporation, the world's largest manufacturer of optical glass. The TELEPLUS HD DGX converters have updated circuitry to record exif data more accurately.In the exif exposure data (meta-data recorded with a digital picture) TELEPLUS HD DGX converters record the equivalent aperture and focal length of the lens setting plus teleconverter. Optically and mechanically they are identical to the prior high-quality TELEPLUS HD DGX converters. Lens performance has been improved dramatically as compared to the MC4 and MC7 models. The improvement in resolution is especially marked, 150% respectively in comparison to the current MC4 model.